The DreamFoam Mattress Ultimate Dreams 13-Inch Gel Memory Foam Mattress is a good choice if your old spring mattress is making it difficult for you to sleep on your side. Featuring a three layered design, the mattress provides full support for your body minus the price tag that comes with other mattresses that have these features. The DreamFoam Mattress is comprised of three layers: the base is made up of a 3 inch, 4 pound gel foam comfort layer, and the next is a two inch, five pound foam support. The final layer is made up of an eight inch high density layer, so combined it provides comfort that you’d expect only from high end products. The multilayered design – and the materials used – reduces the amount of pressure your body feels when you lie down. Studies show that regular mattresses cause discomfort among those who like to sleep on their side because of the poor design, but the DreamFoam mattress addresses these issues thoroughly. The mattresses, all of which are built in the US, are compressed only for short periods to reduce gassing, and the multiple layers provide support for your spine as you lie down. 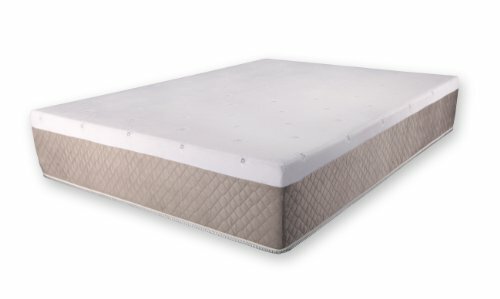 While other mattresses clam they provide this type of support as well, it’s different in the case of the DreamFoam mattress because you get full body support minus the heat that comes with other mattresses. In other words, you’ll be able to sleep comfortably and not get jolted awake because the mattress is too warm. The mattress is soft, but not so much so that you’re bouncing off it, and the fact that it’s allergen resistant is another plus. Finally, the mattress expands quickly, so it doesn’t take as long as other similar mattresses to reach it’s optimum shape. Although the mattress is made up of multiple layers, it’s the uppermost layer that conforms to your body when you lie down. While the upper layer conforms, the second layer remains steady, providing your back with the necessary support. It should be pointed out the mattress conforms to your body as soon as you lie down so you don’t need to wait for the foam to adjust. The fact that the mattress doesn’t have a bounce makes this an ideal choice for couples, because even if your partner turns, you won’t be awakened. If you’re dealing with back aches and been waking up feeling sore, then this mattress will provide relief. A lot of the benefits come from the technologies used for the mattress, but even if you don’t understand the technical details, you’ll be able to tell the difference by its texture and feel. Simply put, the mattress is softer, more conforming and cooler when compared to other mattresses. The mattress also benefits from the gel infusion as it allows the foam to conform to your body’s weight and shape. Essentially, what the gel does is regulate your body temperature so you can rest and relax. This is in stark contrast with ordinary mattresses that usually bring a lot of discomfort. There are a lot of things that one can say about this mattress, but the bottom line is that it will help you sleep, and you will wake up feeling fresh. The reviews for this DreamFoam mattress have been positive, with Jan of LA saying that the mattress is very comfortable and that it’s well worth the money. Bethany also posted a review of the mattress which she bought three months ago. In her review, Bethany writes that from that time till now she has endured no further back problems whilst sleeping, another reviewer from Chicago states she recommends it to anyone who sleeps on their sides and has been suffering back pain. These are just some of the reviews that have been posted online about the mattress, and as you can see they’re very favorable. There are a lot more that you’ll be able to read online, but they basically say the same thing, and that’s the mattress makes sleeping on the side much more enjoyable. The DreamFoam Mattress Ultimate Dreams Mattress offers good value for your money, and the reviews, as indicated above, are very positive. The DreamFoam, in spite of its low price, provides comfort and features you’d only expect from high end mattresses, making this a very good choice if you’re after a dependable mattress that won’t bust your budget.